This is the kick off for season 3 and our seasonal recommendation show. And we have some great recs for you this time around including Victims No Longer, The Urgency of Intersectionality, Not That Bad, Live Awake App. This is part one of our discussion on reporting options, and in this episode you’ll hear Victoria getting into what you should know about reporting to law enforcement. We will walk you through some of the barriers and common questions about this type of reporting. 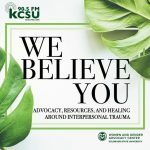 And this episode includes an interview with from Britta Clay, a Victim Advocate for the Fort Collins Police Department. This episode will be dedicated in its entirety to survivor’s experiences of reporting. Remember, each survivors experience in different and unique. If you are thinking about reporting, the issues discussed here are just some of the things that you might consider, but it doesn’t mean that your experience will be better or worse than what these individuals describe. In this episode Casey explores the topic of stalking. We talk about some foundational pieces, like, definitions and statistics. We explore some warning signs to pay attention to. And finally we provide some tips for what to do if you think this is happening to you or a friend of yours. This episode discusses some of the challenges and barriers male survivors face when seeking support and coming to terms with their traumatic experiences, as well as some of the ways that men tend to cope with their experiences of abuse. Resources named in this episode: Victims No Longer by Mike Lew, 1in6.org, Men in the Movement. Many survivors we work with name forgiveness as a complicated and challenging journey with a whole bunch of questions attached to it. It is important to talk about this idea because of how often it comes up for survivors. Throughout this episode, you will hear voices of real survivors and their personal experiences with forgiveness, and Victoria will talk you through some considerations of forgiveness and its role in the healing process.